Drive connection to WebDAB is not writable. There is an error in rename or save etc. However, the connection to the FTP drive is working fine. Please check if you configured your drive item with read-only option. 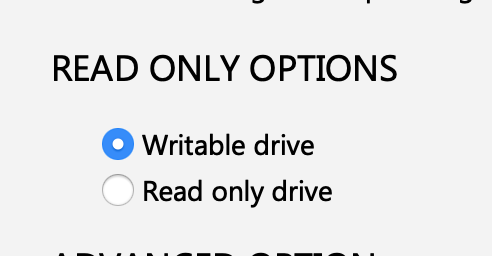 Did you use “Writable drive”? If you cannot write even though you use “Writable drive” option, could you attach debug log files to figure out what happened? I will review your log as soon as possible. According your log files, HTTP 502 error occurred when MOVE operation is requested. I recommend to check your webdav server. I am a beginner who does not understand your answer very difficultly. I would like to be able to use a beginner like me without problems. It should not be a WebDAV connection. Writable is good with WebDAV connections. Could you try with the following test version? The same symptom (WebDAB-Writable disabled). If possible, could you give me a test account to solve it? I will check it as soon as possible. I think you are happy with the following url version. The above version is a beta version. It will be included in the next release version. This v3.8.711 is very satisfied. Please keep it in future update. I sincerely appreciate this response. Reliability is a vertical rise.